In his 1969 seminal text on design methods, “The Sciences of the Artificial,” Nobel Prize laureate Herbert Simon outlined one of the first formal models of the Design Thinking process. Simon’s model consists of seven major stages, each with component stages and activities, and was largely influential in shaping some of the most widely used Design Thinking process models today. 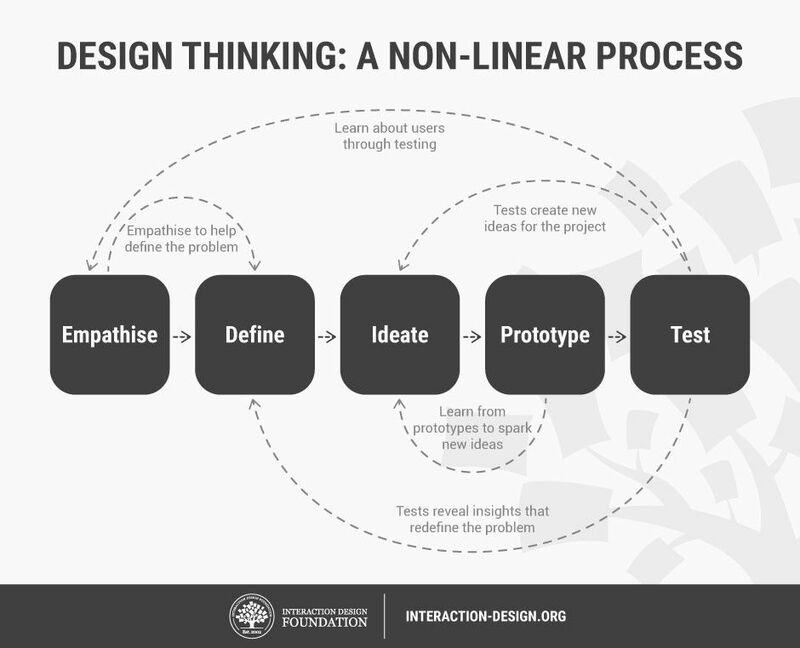 There are many variants of the Design Thinking process in use today, and while they may have different numbers of stages ranging from three to seven, they are all based upon the same principles featured in Simon’s 1969 model. We will focus on the five-stage model proposed by the Hasso-Plattner Institute of Design at Stanford (d.school). d.school is the leading university when it comes to teaching Design Thinking. The five stages of Design Thinking, according to d.school, are as follows: Empathise, Define (the problem), Ideate, Prototype, and Test. Let’s take a closer look at the five different stages of Design Thinking. During the Define stage, you put together the information you have created and gathered during the Empathise stage. You will analyse your observations and synthesise them in order to define the core problems that you and your team have identified up to this point. You should seek to define the problem as a problem statement in a human-centred manner. During the third stage of the Design Thinking process, designers are ready to start generating ideas. You’ve grown to understand your users and their needs in the Empathise stage, and you’ve analysed and synthesised your observations in the Define stage, and ended up with a human-centered problem statement. With this solid background yourself and your team members can start to ‘think outside the box’ to identify new solutions to the problem statement you’ve created, and you can start to look for alternative ways of viewing the problem. There are hundreds of Ideation techniques such as Brainstorm, Brainwrite, Worst Possible Idea, and SCAMPER. Brainstorm and Worst Possible Idea sessions are typically used to stimulate free thinking and to expand the problem space. It is important to get as many ideas or problem solutions as possible at the beginning of the Ideation phase. You should pick some other Ideation techniques by the end of the Ideation phase to help you investigate and test your ideas to find the best way to either solve a problem, or provide the elements required to circumvent the problem. The design team will now produce a number of inexpensive, scaled down versions of the product or specific features found within the product, so they can investigate the problem solutions generated in the previous stage. Prototypes may be shared and tested within the team itself, in other departments, or on a small group of people outside the design team. This is an experimental phase, and the aim is to identify the best possible solution for each of the problems identified during the first three stages. The solutions are implemented within the prototypes and, one-by-one, they are investigated and either accepted, improved and re-examined, or rejected on the basis of the users’ experiences. By the end of this stage, the design team will have a better idea of the constraints inherent within the product, the problems that are present, and have a better/more informed perspective of how real users would behave, think, and feel when interacting with the end product. We may have outlined a direct and linear Design Thinking process in which one stage seemingly leads to the next with a logical conclusion at user testing. However, in practice, the process is carried out in a more flexible and non-linear fashion. For example, more than one stage may be conducted concurrently by different groups within the design team, or the designers may collect information and prototype during the entire project so as to enable them to bring their ideas to life and visualise the problem solutions. Also, results from the testing phase may reveal some insights about users, which in turn may lead to another brainstorming session (ideation) or the development of new prototypes. Design Thinking should not be seen as a concrete and inflexible approach to design; the component stages identified in the image above serve as a guide to the activities that you would typically find. In order to gain the purest and most informative insights for your particular project, these stages might be switched, conducted concurrently and repeated several times in order to expand the solution space, and narrow down on the best possible solutions. As you will note from the image above, one of the main benefits of the five-stage model is the way in which knowledge acquired at the later stages can feedback to earlier stages. Information is continually used to both inform the understanding of the problem and solution spaces, and to redefine the problem(s). This creates a perpetual loop, in which the designers continue to gain new insights, develop new ways of viewing the product and its possible uses, and develop a greater understanding of the users and the problems they face.